If you'd like to support this community information effort, please complete the "Support the UVBB" form and mail it in with your check! 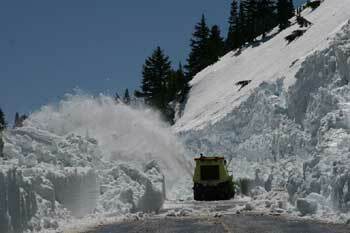 Crews continue to make good progress on snow removal and maintenance from Chinook Pass. Crews are currently in the area of the bathrooms / overlook area, .3 of a mile east of the National Park Entrance at the summit. 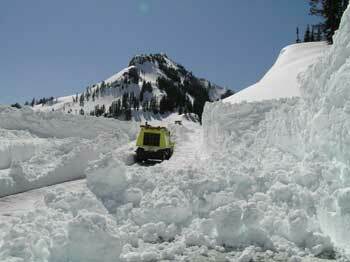 Crews are expected to pass through the roadway cut at the summit early next week and start down the west side towards Lake Tipsoe. West of the summit we are unable to side cast snow because of the decorative rock work and railings. 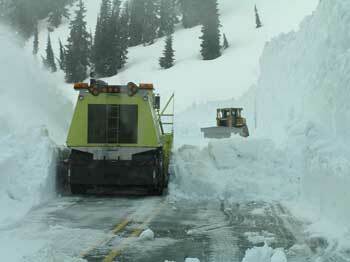 Instead all snow removed from the roadway prism is spaded to the blowers for removal. This process slows our progress some. 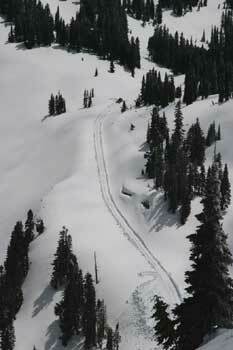 Cooler temperatures this week have kept the snow conditions tight at the ridge tops. 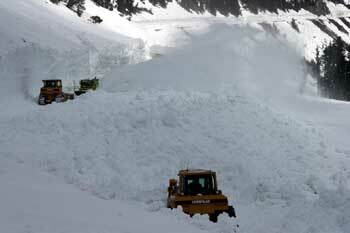 Warming temperatures over the weekend will likely provide better conditions for avalanche control work next week. 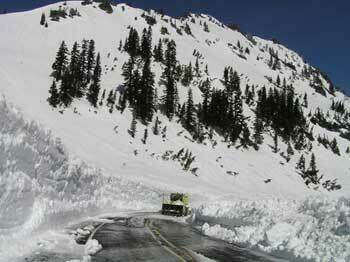 There are still areas of concerns that need to be addressed behind the roadway crews once snow conditions permit. 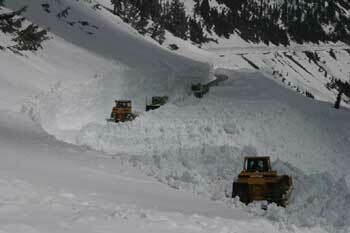 Last fall, construction crews went to work repairing a washed out section of roadway two miles east of the summit. 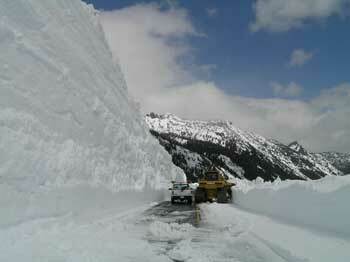 Winter storms snowed them out before they could finish. The contractor has moved in this week to conclude work on this project. 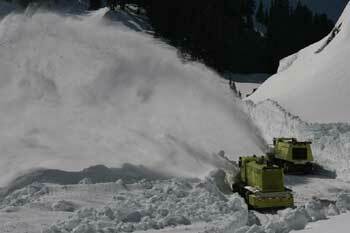 The contractor expects to have all their work completed prior to the opening of Chinook Pass. All of the photos below are in the corner below the restrooms. Dozer pioneering a trail towards Park Archway using GPS markings. Archway is about 300 feet ahead of the bulldozer. 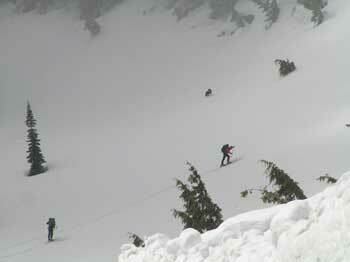 Avalanche crew starting their trek to the ridge top. 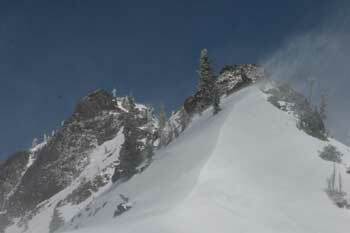 High winds and new snow greeted the avalanche crew this week. 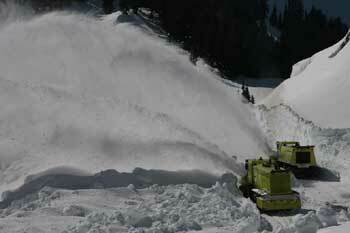 Winds can transport large amounts of snow onto the slopes above the highway. 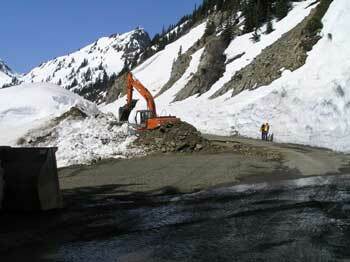 Contractor resuming reconstruction work in the washout area east of the summit. Last fall, the winter weather forced the contractor to leave the area before they were able to complete their project. 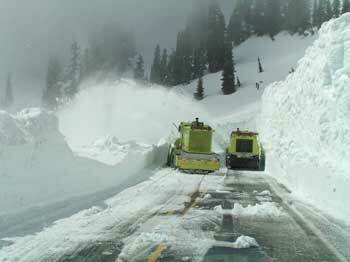 Our thanks to Casey McGill of WS DOT for sharing these great photos so we can see the Chinook Pass conditions as WS Dot endeavors to open Chinook Pass for the season.